There's a lot to worry about when new parents go back to work — like budgeting, child care and getting enough sleep — but most don't have to think about balancing breastfeeding with round-the-clock votes on the federal budget. For New Democrat MP Rosane Doré Lefebvre, however, that's one more thing to worry about. A two-part series on moms in the House of Commons. There's a lot to worry about when new parents go back to work — like budgeting, child care and getting enough sleep — but most don't have to think about balancing breastfeeding with round-the-clock votes on the federal budget. For Rosane Doré Lefebvre, however, that's one more thing to worry about. Doré Lefebvre, 28, is pregnant with her first child. The New Democrat MP is due in mid-April — right around the time she and her colleagues are likely to be studying and voting on the federal budget. She won't be the first MP to give birth since the May 2, 2011, federal election: her caucus colleague Sana Hassainia had a baby boy 13 months ago and is pregnant with her second child. It's clear the current crop of MPs is younger than usual. The NDP caucus is responsible for much of that: while there are young MPs in all caucuses (Conservative MPs Michelle Rempel, 32, and Pierre Poilievre and Andrew Scheer, both 33, come to mind), one-fifth of the 101 New Democrats are under 35. It's possible Canadians could see more offspring out of this group of parliamentarians before the next election in 2015. Because MPs don't pay into Employment Insurance, for them there's no such thing as parental leave. There's also no House of Commons policy dealing with it. Members can see deductions from their $157,731 annual salaries if they're absent from the House for 21 days, unless they're ill, serving in the military or on official public business. It's not clear whether taking time off after giving birth is covered under the illness exemption, particularly if the MP is still in touch with her office staff and dealing with files remotely. Otherwise, members work out time away with their party whips and leaders. The benefit to running their own offices, however, is that they have far more control over their schedules than most Canadians. Labour Minister Lisa Raitt says the biggest problem MPs deal with is the distance. Raitt has two sons, 11-year-old JC and eight-year-old Billy. "The one positive thing about this job is you do have some control over your schedule," she said following one son's Christmas pageant dress rehearsal. "You're able to juggle things around. But there are certain things that you have to do. You have to sit in the House of Commons and you have to vote, and those things take priority over anything else that's happening in your house." 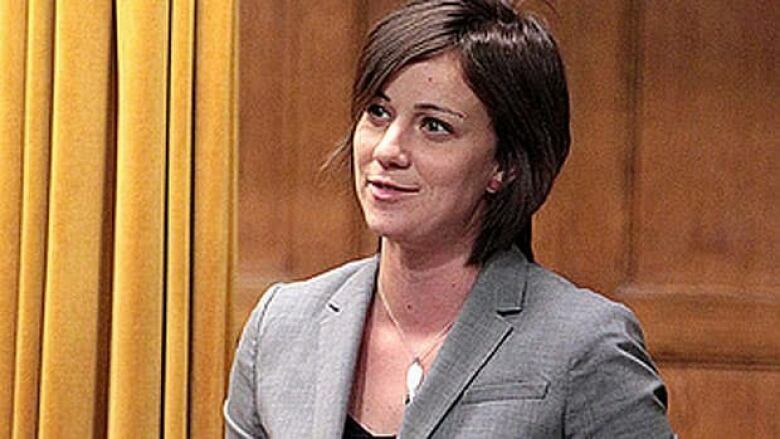 Doré Lefebvre says she isn't sure yet what to expect with her first child, so hasn't decided yet how many "days off or weeks off" she may need to be able to return to Ottawa from her Montreal-area riding of Alfred-Pellan. "What we're thinking is that I'm going to take the time that I need to be comfortable and to be able to travel with a newborn. But it's easy [to go back and forth], it's only a two-hour drive from Ottawa," she said. Doré Lefebvre's partner is going to take on full-time parenting duties after she gives birth. Once the summer break hits at the end of June, the couple will have a slightly easier schedule of constituency events rather than working around Doré Lefebvre's House duties. Hassainia says when she came back to work weeks after giving birth, then-interim NDP leader Nycole Turmel and whip Chris Charlton helped arrange her schedule to make it a little easier. "When we're going back to work two months after giving birth, it isn't easy. For sure we're capable but usually it's very, very hard. And spending a lot of time with the baby, it's a need, not just a whim," she said. Hassainia recalls being too shy to breastfeed in the lobby for opposition MPs adjoining the House of Commons, but her office was too far away to make it an option. Instead, the sergeant-at-arms, who is in charge of security in the House, let her use his office just off the back of the Commons, giving her some private time with son Skander-Jack. "It was very, very kind and very appreciated," said Hassainia, whose partner is their son's primary caregiver. Hassainia and Skander-Jack drew attention to the issue last winter when she brought him into the House before a vote. Scheer, who is the House Speaker and has four children under eight years old, asked one of the pages to take the baby into the lobby because other MPs were crowding around and taking photos. It's against House of Commons rules to cause a disruption in the chamber. Scheer later said it's fine to bring babies into the House chamber so long as there's no disruption and asked for advance warning when possible if MPs need to bring in their babies. While it's still unusual to see babies in the House of Commons, Hassainia wasn't the first. In 1987, Sheila Copps became the first sitting MP to give birth. In 1998, New Democrat Michelle Dockrill brought her seven-week-old baby, Kenzie James, into the Commons as she voted during proceedings. Last year, Bloc MP Maria Mourani said she was told when she had a child that she couldn't bring the baby into the chamber. Former speaker Jeanne Sauvé, who presided over the House of Commons from 1980 to 1984, was behind the Children on the Hill daycare that serves MPs, staff and journalists.